The Sweden on Stage event featured Swedish performers such as The Benny Andersson Band and Miss Li, as well as a variety of activities (primarily around climate change and the environment.) The Electric Pedals 'Green Tea' Pedal-powered tea stall was popular, alongside Friskis & Svettis demonstrations and craft activities like willow sculpture. Major Swedish companies were also involved as event sponsors and had their own stalls / activity centres. Tetrapak hosted various arts / crafts activities and IKEA provided one of the highlights for the day, IKEA crazy golf! The IKEA Crazy Golf was very popular and a great way of showcasing IKEA products. Instead of hitting the ball through a windmill or into a tiger's mouth, golfers had to negotiate their way around obstacles made up of IKEA products! Following holes were then themed around IKEA lighting, IKEA storage, IKEA shelves, an IKEA sofa and IKEA taps. IKEA keep surprising me with the way they act (flash operas in store, virtual furniture etc) and IKEA crazy golf was very enjoyable. 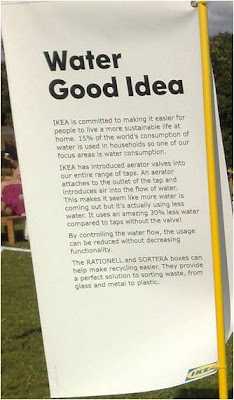 A great way of engaging consumers in the latest IKEA products, whilst promoting IKEA's environmental credentials. A great day out - thank you Embassy of Sweden! We have just added your latest post "IKEA Crazy Golf at 'Sweden On Stage', Hampstead Heath" to our Directory of Sports. You can check the inclusion of the post here . We are delighted to invite you to submit all your future posts to the directory and get a huge base of visitors to your website.